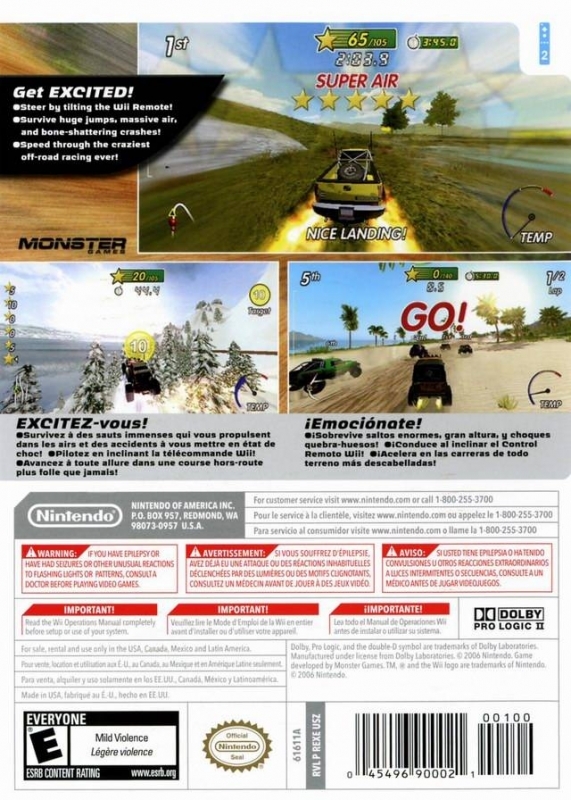 "Nintendo's classic franchise races its way to high altitudes of excitement." Get ready for big-air jumps and bone-crunching crashes in EXCITE TRUCK, an off-road racing experience unlike anything players have tried before. Tilt the Wii Remote™ right and left like a steering wheel to steer. Once the truck goes airborne, tilt the Wii Remote every which way to line up perfect landings for turbo boosts. When players run over exclamation point icons on the course, the terrain morphs in real time - turning innocent bumps into massive launch pads. In the spirit of Excitebike®, success depends on dodging obstacles at high speeds, pulling off huge airs and lining up perfect landings. 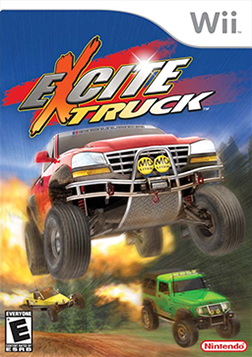 How to progress through the game: In EXCITE TRUCK, the main goal is to jump and bump to the highest score and best finish. The more points players gain, the higher their status grows - which in turn unlocks new courses. When players first start the game, they’ll need to pass a series of tutorial challenges that teach the basics of driving and racing a truck. After they’ve completed those challenges, they can enter Excite Mode and race against other trucks in a series of globe-spanning races. 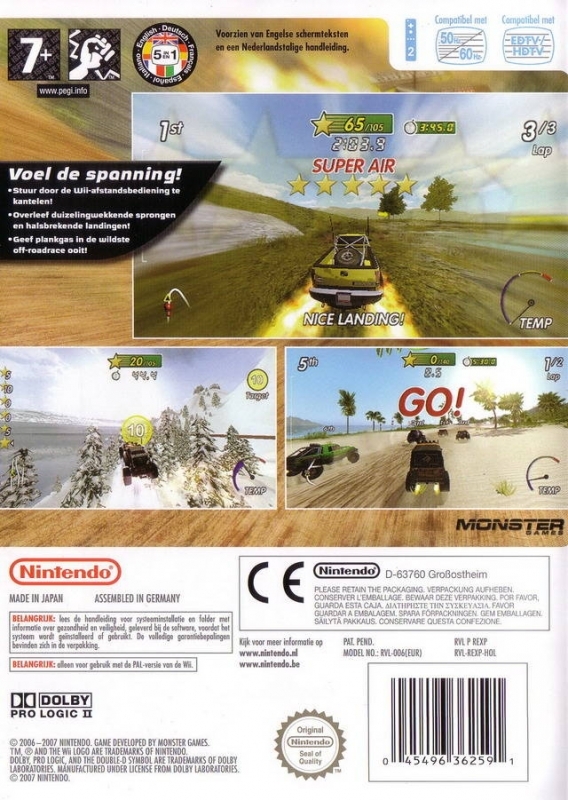 During the race, they hold the Wii Remote sideways and turn it to steer around corners and fly off of huge jumps. 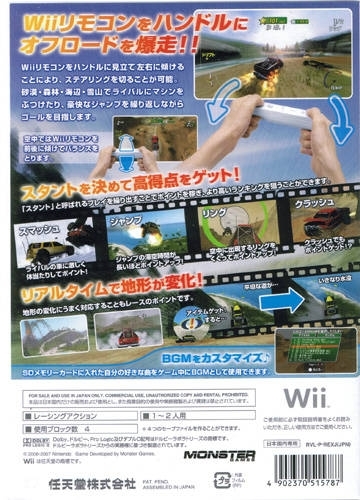 In the air, players can tilt the Wii Remote to control their descent. If they land with all four tires touching the ground, they’ll get a massive speed boost. Each dangerous stunt players pull off will earn stars. The total number of stars players earn determines their race rating. As players complete series of races, they will unlock even more challenging racing courses. Special powers/weapons/moves/features: Each truck has a turbo charger that gives it a huge temporary speed boost. However, if players use the turbo too much, their engine will overheat. At the beginning of the game, players have access to only a handful of vehicles. As they earn points for completing races, they’ll unlock additional trucks and buggies. During races, they can collect pick-ups that dynamically morph the terrain or make trucks temporarily powerful enough to send trees flying. Sales need to be fixed (was around 0.9). Five years later, I still play it sometimes. erm... where did the sales go? this used to be close to 1m and now its not even at half. The only downfall of this game is that the multiplayer isn't more robust. One of the best racing games I have ever played. Roughneck!